Alexander Beecroft: Authorship and Cultural Identity in Early Greece and China. Patterns of Literary Circulation. Cambridge University Press, 2010. C. Philipp E. Nothaft: Dating the Passion. The Life of Jesus and the Emergence of Scientific Chronology (200-1600). (Time, Astronomy, and Calendars: Texts and Studies 1). Leiden/Boston, Brill, 2012. Peter Sawyer: The Wealth of Anglo-Saxon England: Based on the Ford Lectures Delivered in the University of Oxford in Hilary Term 1993. Oxford University Press, 2013. Ole J. Benedictow: What Disease was Plague? On the Controversy over the Microbiological Identity of Plague Epidemics of the Past. Leiden, Brill, 2010. Rebecca Earle: The Body of the Conquistador. Food, Race and the Colonial Experience in Spanish America, 1492-1700. Cambridge University Press, 2012. Steen Busck: Et landbosamfund i opbrud. Sundby Mors 1660-1800. Bind 1-2. Aarhus, Forlaget Klim, 2011. Ole Hyldtoft: Mad, drikke og tobak 1800-35. Forbrugsmønstre, kultur og diskurser. København, Museum Tusculanums Forlag, 2012. Jeppe Nevers: Fra skældsord til slagord. Demokratibegrebet i dansk politisk historie. 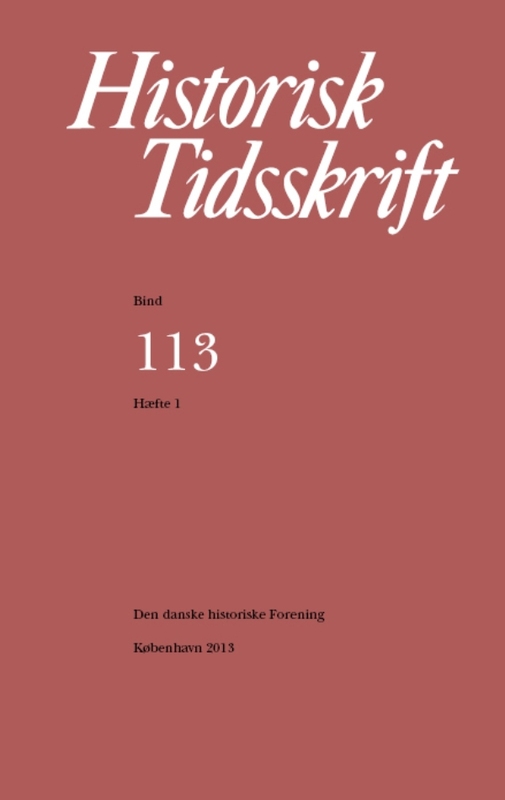 (University of Southern Denmark studies in history and social sciences, vol. 412). Syddansk Universitetsforlag, Odense 2011. Sönke Loebert, Okko Meiburg & Thomas Riis: Die Entstehung der Verfassungen der dänischen Monarchie (1848-1849). (Kieler Werkstücke; Volume 32). Frankfurt am Main, Peter Lang Verlag, 2012. Dansk velfærdshistorie. Bind 3: 1933-1956: Velfærdsstaten i støbeskeen. Red. : Jørn Henrik Petersen, Klaus Petersen & Niels Finn Christiansen. Syddansk Universitetsforlag, 2012. Alan S. Milward and a Century of European Change. Eds. : Fernando Guirao, Frances Lynch & Sigfrido M. Ramírez Pérez. (Routledge Studies in Modern European History). New York – London, Routledge, 2012.